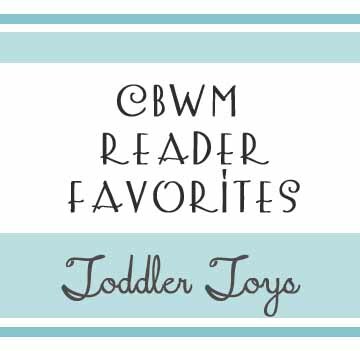 For this post, share your favorite toys for the toddlers 18 months on through age two (this means the year the child is two, up until he/she turns three). Please share the name of the toy and a brief reason why you/your child likes it. Please also include the age the child liked it since it is such a large range. You can also add a link to be sure I will be able to identify the correct toy when I move it to the main body of this post. Thanks so much! (This post contains affiliate links). My daughter, almost 2.5, loves the Fisher Price Tool Kit . She loves to help Daddy fix things, with her play tools and real tools. She also loves to ride her tricycle . Drawing on her chalk board is a big hit as well. Oh, and babies…anything baby…stroller , carrier , bottles, paci’s, the list goes on and on. Oh, and BUBBLES ! My older daughter turns three this month. In the last few months it has been dress up clothes . She is partial to the princess gear, but not any princess inparticular. She likes the heeled shoes and pull on skirts that she can put on herself and spin in. The quality of spin has been very important! Reflectiing back over the last year and a half is a long time!! Big hits over that time was Mr. Potato Head – we have a family of them, cooking tools , Little People house , and variuos stuffed animals. My son is almost 29 months. He LOVES any kind of car , whether playing on the floor, parking in homemade garages/parking lots, playing in the sandbox, bathtub, driveway,… he never gets tired of them. Other most popular toys are Duplo Legos , train table , lawn mower , homemade water table, and large floor puzzles . Another great truck is the “Green Toys Recycling Truck” which allows him to dump garbage. Oh my god this is so darn cool! It’s a DVD all about heavy duty trucks. I found the videos on youtube and then just had to go buy the full DVD. The DVD package comes with a free T-shirt. It’s the coolest ever for his short TV time. I have to echo a lot of the above comments. My son LOVES vehicles of all kinds. He loves books about vehicles, like this one from Richard Scary. Other outside toys he loves are sidewalk chalk, a bubble mower, and he just got a little kid Big Wheel for his birthday which he loves. Another toy he loves that he just got for his birthday is one that many of us moms will remember, the Fisher Price Record Player. My son is very musical and likes to play the instruments we have in the house. My husband is a drummer and guitarist so our son loves to play those instruments. If you can get your hands on play/handheld instruments (like maraccas), your toddler will be tickled. I have found that my son loves everything right now. Honestly, he will play with toy after toy after toy. He isn’t too picky. But the above mentioned are his favorites.